North Grafton – Major General Raymond A. Vezina, 76 (USARNG ret), former Massachusetts Adjutant General, passed away unexpectedly Monday, April 4, 2016 after a year of declining health. Raymond was born in Worcester, son of Lionel and Henrietta (Gingras) Vezina. He grew up in Worcester, graduated from Assumption Prep, and was awarded his bachelor and master degrees from Anna Maria College. In 1966, Ray, with a calling to serve his country, enlisted as a private in Army National Guard, beginning a long and stellar career of over 37 years in service to the citizens of Massachusetts. 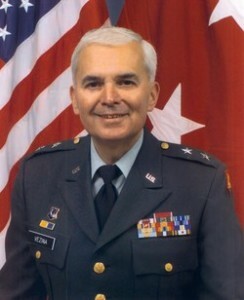 In 1993, he was appointed a two star Major General, assuming the command as Massachusetts State Adjutant General for all branches; a position he held for six years until retiring in 1999. Following retirement, he worked five years for the Worcester County Sheriff’s department of correction for its outreach program. Ray was a member of the Association of the United States Army, Knights of Columbus, Worcester County Deputy Sheriff’s Association, Ancient and Honorable Artillery Company of Boston, and a life member of the National Guard Association of the United States and the state of Massachusetts. Ray is survived by his devoted wife of 31 years, Elaine F. (O’Loughlin) Vezina; daughters, Denise Pelkey and her husband Paul of Westborough and Amy Vakoc of Northbridge; brother, Gerard Vezina and his companion Rosie Harrison; sister, Constance Valois and her companion Carl Martin of Whitinsville; three adored grandchildren who called him Papa, Cameron, Mary, and Kaylee; dear friend, Roger Wykes, who he considered a son, and his wife Melissa of Rutland; and many nieces, nephews, and extended family members. He was predeceased in 2012 by a son, Robert Vezina. Ray was devoted to his family. He was a gentle and kind man who possessed a strong faith. He was a lifelong communicant of St. Joseph’s, now Holy Family Parish in Worcester. Ray enjoyed the simple things in life: being at home with Elaine, dining out, relaxing at their summer home in York, Maine, and cheering for “his” Red Sox and Patriot teams. He loved being surrounded by his family and friends. He was most proud of his grandchildren, followed by his French heritage and his father’s birthplace, Canada. He and Elaine enjoyed many fun filled visits to Quebec. Ray was an eternal optimist; his glass was never just full, but always overflowing. Friends and family are invited to calling hours Friday, April 8, from 4-8 p.m., in the Mercadante Funeral Home and Chapel, 370 Plantation St., Worcester. The funeral will be held Saturday, April 9, beginning from the funeral home at 10 a.m. with a procession to St Joseph/Holy Family Church, 35 Hamilton St., Worcester, for the Celebration of Life Mass at 10:30 a.m. Burial with full Army Honors will follow in Notre Dame Cemetery. The family requests that flowers be omitted and memorial remembrances be made in Ray’s name to Holy Family Parish, 41 Hamilton St., Worcester, MA 01604; the Cystic Fibrosis Foundation, 220 N. Main St. #104, Natick, MA 01760; or the Alzheimer’s Association, 480 Pleasant St., Watertown, MA 02472.